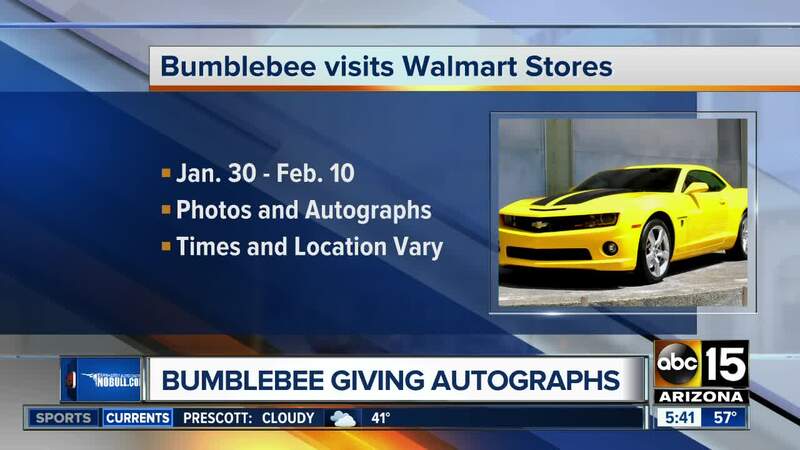 'Bumblebee' to visit Walmart stores in Arizona from January 30 to February 10. PHOENIX — Kids and families will have an opportunity to meet Bumblebee, the yellow-and-black car that turns into a robot from the Transformers franchise. The character will visit 28 Walmart stores around the Valley between Jan. 30 and Feb. 10 to sign autographs and take pictures. It is part of a promotion for the Transformers spin-off movie, Bumblebee, which was released to theaters in December. It is a free event. Per the schedule, Bumblebee will be at Walmart stores in two-hour increments. Jan. 30: Walmart, 240 W. Baseline Road, Mesa, AZ, 6 – 8 p.m.
Jan. 31: Walmart, 4505 E. McKellips Road, Mesa, AZ, 2 – 4 p.m.
Jan. 31: Walmart, 1606 S. Signal Butte Road, Mesa, AZ, 6 – 8 p.m.
Feb. 1: Walmart, 21055 E. Rittenhouse Road, Queen Creek, AZ, 2 – 4 p.m.
Feb. 2: Walmart, 4915 N. Pima Road, Scottsdale, AZ, 2 – 4 p.m.
Feb. 2: Walmart, 15355 N. Northsight Blvd., Scottsdale, AZ, 6 – 8 p.m.
Feb. 3: Walmart, 1825 W. Bell Road, Phoenix, AZ, 2 – 4 p.m.
Feb. 3: Walmart, 18551 N. 83rd Ave., Glendale, AZ, 6 – 8 p.m.
Feb. 6: Walmart, 14111 N. Prasada Gateway Ave., Surprise, AZ, 2 – 4 p.m.
Feb. 6: Walmart, 1060 S. Watson Road, Buckeye, AZ, 6 – 8 p.m.
Feb. 7: Walmart, 13055 W. Rancho Santa Fe Blvd., Avondale, AZ, 2 – 4 p.m.
Feb. 7: Walmart, 5845 W. Bell Road, Glendale, AZ, 6 – 8 p.m.
Feb. 8: Walmart, 5010 N. 95th Ave., Glendale, AZ, 2 – 4 p.m.
Feb. 8: Walmart, 2020 N. 75th Ave., Phoenix, AZ, 6 – 8 p.m.
Feb. 9: Walmart, 5605 W. Northern Ave., Glendale, AZ, 2 – 4 p.m.
Feb. 9: Walmart, 6145 N. 35th Ave., Phoenix, AZ, 6 – 8 p.m.
Feb. 10: Walmart, 41650 W. Maricopa-Casa Grande Highway, Maricopa, AZ, 2 – 4 p.m.
Feb. 10: Walmart, 1741 E. Florence Blvd., Casa Grande, AZ, 6 – 8 p.m.